Barney Miller is an American sitcom set in a New York City Police Department police station on East 6th St in Greenwich Village. The series was broadcast from January 23, 1975, to May 20, 1982, on ABC. It was created by Danny Arnold and Theodore J. Flicker. Noam Pitlik directed the majority of the episodes. Barney Miller takes place almost entirely within the confines of the detectives' squad room and Captain Barney Miller's adjoining office of New York City's fictional 12th Precinct, located in Greenwich Village. A typical episode featured the detectives of the 12th bringing in several complainants and/or suspects to the squad room. Usually, two or three separate subplots are in a given episode, with different officers dealing with different crimes. Once a year, an episode would feature one or more of the detectives outside of the walls of the precinct, either on a stakeout or at one of their homes. Captain Bernard "Barney" Miller (Hal Linden) is the sensible captain of the precinct who uses his odd and dry sense of humor to retain his sanity while dealing with the foibles of his staff and the unending stream of budget problems and paperwork that make up his job. He gets passed over for a promotion to deputy inspector several times during the series' run before reaching that rank in the series finale. Sgt. Philip K. Fish (Abe Vigoda) is the senior detective on the squad. Crotchety, world-weary, and near retirement, he always seems to be suffering through some physical ailment, but his years of experience as a police officer make him a very good detective and mentor to other members of his squad. Frequently, he is on the phone dealing with a minor marital crisis with his wife Bernice. The character was eventually spun off into its own series. Det. 3rd Grade (later Sgt.) Stanley Thaddeus "Wojo" Wojciehowicz (Max Gail) is the naive, gung-ho but goodhearted Catholic Polish-American, who gradually transforms from a macho former Marine into a decidedly humanitarian character (the squad's conscience, in many ways), while performing his duties as a detective. He takes and fails the sergeant's examination four times, but finally passes on his fifth try and gets promoted in season four. He is a very dedicated and by-the-book police officer who tends to take his duties a little too seriously at times. Det. 1st Grade (later Sgt.) Ron Nathan Harris (Ron Glass) is an ambitious, intellectual African American criminologist who has a taste for the finer things in life and thus lives well beyond his means, and who frequently seems more preoccupied with his attire and his career as a writer than with his police work. A long-running plotline about his various attempts to establish a writing career eventually has Harris emerge as a published author, with his lurid memoir Blood on the Badge (originally titled Precinct Diary), which becomes a best seller and thus prompts him to become more serious with his works. Harris was educated by Jesuits and served in the Coast Guard prior to becoming a police officer. He is a self-professed Republican, but also a former war protester and an ardent supporter of the police officers' union strike action. Sgt. Miguel "Chano" Amanguale (Gregory Sierra) is a dauntless, beleaguered Puerto Rican detective, who is very emotionally attached to his job; as such, he has a habit of getting very worked up when things go awry and tends to explode in rapid Spanish should it happen. His lowest moment comes in "The Hero," when he kills two suspects who are robbing a bank. Sgt. Arthur P. Dietrich (Steve Landesberg) is a detective with a calm, unflappable nature and a seemingly endless supply of knowledge on a wide array of subjects (as Barney once opined, having a "flair for the esoteric"). He can usually find a topic to discuss with those he encounters in the squad room, whatever their interest or occupation, though he often expresses it in an overly intellectual manner. In "The Photographer," Barney goes so far as to suggest to Dietrich that has a "pedantic" way of expressing himself. Deputy Inspector Frank Luger (James Gregory) is Miller's rambling, out-of-touch, and unapologetically old-school superior who frequently drops by the precinct to "chat with" Barney. He refers to Harris as "Har'" and Dietrich as "D-D." As time goes by, Luger becomes more and more melancholy and his outdated approach to police work more and more problematic. Officer Carl Levitt (Ron Carey) is a diminutive and obsequious (but competent and hard-working) uniformed officer who constantly, passive-aggressively badgers Miller about being promoted. He is finally promoted to detective in the series finale. Elizabeth Miller (Barbara Barrie): Barney's wife, a dedicated social worker, was intended to be a regular character, and listed in the opening credits during seasons one and two. Nevertheless, Liz is seen fairly infrequently. She is, however, often referred to, and Barney is often seen (and heard) on the phone with her. The show's focus was split between the detectives' interactions with each other and with the suspects and witnesses they detained, processed, and interviewed. Some typical conflicts and long-running plotlines included Miller's frustration with red tape and paperwork, his constant efforts to maintain peace, order, and discipline, and his numerous failed attempts to get a promotion; Harris's preoccupation with outside interests, such as his living arrangements but mainly his novel (Blood on the Badge), and his inability to remain focused on his police work; Fish's age-related health issues, marital problems, and reluctance to retire; Wojciehowicz's impulsive behavior and love life; Luger's nostalgia for the old days with partners Foster, Kleiner, and "Brownie" Brown; Levitt's quest to become a detective (which is eventually successful); the rivalry between the precinct's resident intellectuals, Harris and Dietrich; and continually—but reliably—bad coffee, usually made by Yemana. Hal Linden Captain Barney Miller 1–8 Main star and regular character throughout the series' run. In the Season 5 episode "Accusation", it is learned that he worked Vice for a time previous to being assigned to the 12th Precinct. Max Gail (second season billed as Maxwell Gail) Detective Stan "Wojo" Wojciehowicz 1–8 Regular character throughout the series' run. Ron Glass Detective Ron Harris 1–8 Regular character throughout the series' run. James Gregory Deputy Inspector Franklin D. Luger 1–8 A regular character throughout the series, usually seen in about a third to a half of any given season's episodes. Gregory was only listed in the opening credits during Season 4, and in the first four episodes and last episode of Season 5; in other seasons, he was listed as a "Special Guest" in the closing credits. Abe Vigoda Sergeant Philip K. Fish 1–4, 7 Vigoda was a regular for the first three seasons. Though still in the opening credits, he appeared in only about half of the episodes in the last half of Season 3. (The character was simultaneously seen on the spin-off show Fish.) Fish "retired" as of Season 4, Episode 2, though he returned for two guest appearances, one later in Season 4 and one in Season 7. Jack Soo Sergeant Nick Yemana 1–5 A regular in Seasons 1 to 5, Soo died on January 11, 1979 (midway through Season 5). A special memorial episode was aired, with the actors breaking character and recalling their favorite Yemana scenes. The episode ended with the entire cast raising their coffee cups in tribute. Barbara Barrie Elizabeth "Liz" Miller 1–2, 4, 5 Though appearing in only a handful of episodes after the pilot, Barrie received billing in the opening credits of every episode in Seasons 1 and 2. Often mentioned, her character returned for a one-episode guest appearance in Season 4, and a two-part guest appearance and a single episode guest appearance in Season 5. Gregory Sierra Sergeant Miguel "Chano" Amanguale 1–2 Regular character for seasons 1 and 2, then left the show. No explanation is given for his character's absence at the start of Season 3. In Season 4, Officer Roslyn Licori is brought in as his replacement two years after the official request was made (with no satisfactory explanation from the Personnel Department as to why the request took so long to be filled). Ron Carey Officer Carl Levitt 3–8 Carey first appeared as a perp, Angelo "The Mole" Molinari, in the last episode of Season 2. He began his role as a recurring character, Officer Levitt, in Season 3, becoming a full-time cast member by Season 4 (his character would finally make detective in the series' final episode). Milt Kogan Desk Sergeant Kogan 1–2 Though not seen after season 2, Kogan (the downstairs desk sergeant) was frequently referred to throughout the series' run. George Murdock ‡ Lt. Ben Scanlon, Internal Affairs 2, 4–8 A member of the Internal Affairs Department, the eternally suspicious Scanlon was not attached to the 12th Precinct. He was first shown to be a lieutenant from Manhattan South. Previously worked as a member of the vice squad for 17 years. His visits from headquarters involved trying to find corruption inside the precinct, especially in the detective squad, and he gradually became more and more obsessive in his determination to prove that Barney was not as upright and honest as he appeared. Linda Lavin Detective Janice Wentworth 1, 2 An extremely dedicated and enthusiastic (sometimes overly so) member of the squad who developed a romantic relationship with Wojo. After a short run as a regular guest on Barney Miller (beginning with episode 8 of the first season, "Ms. Cop"), Lavin left the series to star in Alice. Wentworth's name can still be seen on the staff duty roster through most of Season 3 and a flashback scene of her was used in the final episode. June Gable Detective Maria Battista 3 Short-lived addition to the 12th Precinct's detective room, lasting two episodes. Almost as gung-ho as her predecessor Wentworth. Secretly disliked by Levitt for having made detective even though she was shorter than he was. Mari Gorman ‡ Officer Roslyn Licori 4 Gorman made a guest appearance (season 4, episode 3) as an amateur prostitute housewife, and then, after a three-episode run as Licori in season 4, she played another recurring role during season 8, as Mrs. Binder, wife of frequent precinct visitor Bruno Binder. Dino Natali Officer Zatelli 4–7 A gay officer. Particularly loathed by the homophobic (and possibly closeted) Lt. Scanlon, who desperately wants to find a reason to fire him; after he was outed by a careless remark by Wojo, he was promoted to a position as Administrative Assistant at Police Headquarters. Paul Lieber ‡ Detective Eric Dorsey 7 Another three-episode detective, who came in with a cynical attitude toward the squad that Levitt took as a good sign that the newcomer would not fit in. Dorsey straightened out, but was reassigned regardless. Val Bisoglio Sgt. Grimaldi / Det. Del Vecchio 2 Bisoglio portrayed both Sgt. Grimaldi in the pilot and a stone-faced narcotics detective in a separate Season 2 episode involving missing marijuana. Kenneth Mars Officer Callaghan 3 "Blabbermouth" motorcycle cop who fuels Wojo's fears of civic disaster and spreads rumours about Luger's involvement with a married Bensonhurst cashier. Eddie Barth Detective DeLuca 1 Plain-clothes 12th precinct detective who appeared in one episode, joining Barney, Fish and Wojo on an apartment house stake-out. Ed Peck Patrolman Slater 3, 5 Attended police academy with Fish in the 1940s, he reminisces about his past crush on the then-single "Bernice Gruber" and heavily implies not only an actual history with her, but an abiding interest; much to Fish's aggravation. Slater is later partnered with Patrolman Darvec, a rookie, and they both fire shots at Harris, who they misidentify as a perpetrator. John Clavin Lt. Vogel 4 Reassigned from Staten Island, Lt. Vogel (reluctantly) takes command of the 12th Precinct when Barney is temporarily suspended for disobeying an order. Bruce Kirby Lt. Rossmore 4 Manhattan South lieutenant who calls upon Barney to intervene as intermediary in a stalled landlord/tenant dispute. George Loros Sgt. Mike Hunt 4 Internal Affairs officer who attempts to bribe the 12th Precinct detectives while posing as drug dealer "Glynn". Joe Mantell Raymond Waymond 8 Internal Affairs officer, "a lawyer and a cop", who investigates after Wojo is forced to shoot a drug-addled suspect during a robbery. Jenny O'Hara Sgt. Schofield 6 Undercover officer who tries to apprehend a dentist suspected of fondling patients. O'Hara appears in a separate episode as a character filing a missing persons report. Jonelle Allen Officer Turner 2 Officer Turner featured in one episode as an overzealous officer who makes a problematic undercover drug-bust on a city college campus. Nellie Bellflower Officer Carney 2 Officer Carney is Officer Turner's partner. She becomes very emotional and is proffered reassurance by a clearly discomfited Inspector Luger. Gloria Calomee Detective Bailey 2 Detective Bailey featured in one episode as an undercover officer working park detail accompanied by Chano in drag. ‡ Murdock, Gorman, Dullaghan, and Leiber all made guest appearances in other roles in addition to their regularly recurring series roles. Barney Miller had a stock company of character actors who made frequent appearances in different roles, among them Don Calfa (7 episodes), Rod Colbin (7), Phil Leeds (7), Ralph Manza (7), Oliver Clark (6), Arny Freeman (6), Peggy Pope (6), Philip Sterling (6), Kenneth Tigar (6), Martin Garner (5), Walter Janowitz (5), Howard Platt (5), Leonard Stone (5), Ivor Francis (4), Jay Gerber (4), Larry Gelman (4), Michael Lombard (4), Edwin Malave (4), Rosanna DeSoto (4), Todd Susman (4), Michael Tucci (4), Sal Viscuso (4), Candice Azzara (3), Eugene Elman (3), Bruce Kirby (3), Jack Kruschen (3), Richard Libertini (3), Kay Medford (3), Nehemiah Persoff (3), Titos Vandis (3), Michael Durrell (2), Alix Elias (2), Peter Jurasik (2), Jenny O'Hara (2), Walter Olkewicz (2) and Lyman Ward (2). Jack DeLeon Marty Morrison 8 1–8 Marty, an openly gay man, is arrested for snatching purses in the series' second episode. Later he is occasionally brought in as a suspect, other times as a complainant. Alex Henteloff ‡ Arnold Ripner 7 1–8 An ambulance-chasing attorney, Ripner visits the precinct whenever he has a client to defend. His first appearance is in the series' second episode as Marty Morrison's lawyer. (He also sometimes visits just to try to drum up business amongst those in the holding cell.) Ripner later sues Harris for Harris' depiction of him in his novel Blood on the Badge, winning a $320,000 judgment. Stanley Brock ‡ Bruno Binder 7 4–8 The owner of a sporting goods store and would-be vigilante frequently in trouble for his overzealous ways to get rid of what he considered undesirable elements. Jack Somack Mr. Cotterman 6 2–5, 7 Owner of the frequently-robbed Cotterman's Liquor Store. In the second part of the season 7 episode "Homicide", the squad learns that he was shot in the head and killed by two would-be extortionists. Ray Stewart Darryl Driscoll 5 2–8 Marty's somewhat more sensible and grounded lover, who lends Marty moral support during his visits to the precinct; formerly married with a young son. John Dullaghan ‡ Ray Brewer 5 5–8 A transient, Ray stops by the precinct during open houses to talk and sample the coffee, and once to report that other residents of the mission where he stays have been abducted. Later joins the Salvation Army. J.J. Barry ‡ Arthur Duncan 4 7–8 A small-time crook who is frequently arrested. Ralph Manza ‡ Leon Roth 4 3–8 A blind man who is first arrested for shoplifting, Mr. Roth returned later as both arrestee and complainant. Doris Roberts ‡ Harriet Brauer 3 4–7 A frequent complainant (against her husband). Peter Hobbs Phillip Brauer 3 4–7 A middle-aged married man whose attempts to bring excitement and meaning into his life result in conflict with his wife. Paula Shaw Paula Capshaw 3 3–4 A cynical prostitute who is a frequent arrestee. Carina Afable Perlita Avilar 3 8 Inspector Luger's prospective Filipina "mail-order bride". Fish's wife Bernice made an appearance from time to time in Seasons 1 to 4. In Seasons 1, 3 and 4 she was played by Florence Stanley (in a total of seven appearances); in Bernice's only Season 2 appearance she was portrayed by Doris Belack. In that episode, Fish also had a grown daughter named Beverly played by Emily Levine. Also seen as recurring characters in Season 3 were group home children Jilly (Denise Miller) and Victor (John Cassisi), who would eventually become Fish's foster children. In 1977, the Fishes were spun off into their own show, Fish which also starred Barry Gordon, who memorably played an embezzler who gets a pay raise and promotion in Season 5 and a lawyer representing Wojo in Season 8. In addition to Barney's wife Liz, Barney's son David (Michael Tessier) and daughter Rachel (Anne Wyndham) appeared in the pilot. Barney's son was written out of the show after the first episode (though his daughter appeared once more, in The Courtesans), while his wife made appearances through the second season. Wyndham also reprised her role in two later episodes. Darlene Parks played Wojo's ex-prostitute girlfriend Nancy in a 2-episode arc in Season 5. The episodes focus on the 'period of adjustment' following Nancy's move into Stan's apartment. The series was born out of an unsold television pilot, The Life and Times of Captain Barney Miller, that aired on August 22, 1974, as part of an ABC summer anthology series, Just for Laughs. Linden and Vigoda were cast in their series roles; no other eventual cast members were present. Abby Dalton played Barney Miller's wife, Liz, while Val Bisoglio, Rod Perry, and a pre-Hill Street Blues Charles Haid rounded out the cast of the pilot. Guest stars included Mike Moore, Chu Chu Mulave, Henry Beckman, Buddy Lester, Michael Tessier and Anne Wyndham. The pilot script was later largely reused in the debut episode Ramon. For this reworked episode, Bisoglio's lines were more or less evenly split between the new characters of Yemana and Chano, while Haid's character of Kazinski became Max Gail's Wojciehowicz. Rod Perry's character, Sgt. Wilson, was replaced by Harris in the reworked episode, although Wilson would reappear one more time in the first-season episode Experience before disappearing from the series entirely. Abby Dalton was replaced by Barbara Barrie as Liz, and Henry Beckman's character of Uncle Charlie was dropped entirely. The rest of the guest cast (Moore, Malave, Lester, Tessier and Wyndham) reprised their roles in the debut episode. Unlike the remainder of the series, the pilot was shot on film at CBS Studio Center, where the sets of the 12th Precinct and the Miller apartment were originally built. When the show went into regular production in late 1974, it was recorded on videotape. The sets were moved to the ABC Television Center in Hollywood, where they remained until production ended in 1982. The pilot was never broadcast in syndication. It was released in 2011 as part of Shout Factory's complete series set on DVD. 1 13 January 23, 1975 (1975-01-23) May 1, 1975 (1975-05-01) 68 14.7 "Ironside", "Hot l Baltimore"
The show's instrumental jazz fusion theme music, written by Jack Elliott and Allyn Ferguson, opens with a distinctive bass line performed by studio musician Chuck Berghofer. The bass line was improvised by Berghofer at the request of producer Dominik Hauser: "Can you do something on the bass? This guy is a cop in New York. Can we just start it out with the bass?" The theme song was ranked #23 and #27, respectively, by Complex and Paste magazines, in their lists of "best TV theme songs". The theme plays over the Manhattan skyline, followed by shots of the characters and opening credits. Season 1 opened and closed with a shot of Midtown Manhattan as seen from Weehawken, New Jersey. Season 2 onward opened with a shot of Lower Manhattan as seen from Brooklyn Heights, with a barge being towed in the foreground, and closed with a shot of the Midtown Manhattan skyline as seen from Long Island City. Several versions of the theme were used during different seasons, with minor variations in composition and performance. 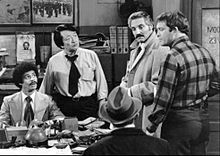 Production of Barney Miller deliberately resembled a theatrical stage play; scenes rarely strayed from the precinct station's squadroom, with its prominent open-barred holding cell, and Miller's adjoining office. The room was said to be on the second or third floor, depending on the episode. Clutter was plentiful and much of it seemed immobile over the years. Characters came and went, but almost always within the confines of the precinct. A bare handful of episodes (fewer than a dozen of 170) were partially or fully set in other locations, including a stakeout location ("Stakeout"), a hospital room ("Hair"), an undercover operation ("Grand Hotel"), a jail (three separate rooms in "Contempt"), a hotel room ("Chinatown"), and the apartments of Barney ("Ramon") and ("Graft"), Chano ("The Hero"), Fish ("Fish") and Wojo ("Wojo's Girl"). In "The DNA Story," we see the inside of the men's room. Barney Miller tended to obey two of the three classical unities of drama: unity of place and unity of time. The third unity, unity of action, was not followed, since each episode had multiple subplots. Barney Miller was one of the few sitcoms of the period that occasionally mentioned the then-current year or allowed the audience to infer the then-current year. Barney Miller was notorious for its marathon taping sessions. Early seasons were recorded before a live studio audience and used a laugh track for sweetening reactions during post-production. Creator and executive producer Danny Arnold would then rewrite and restage entire scenes after the audience departed, actively looking for quieter, subtler moments that would not play well before a crowd; a taping session that began in the afternoon or early evening would then continue into the early morning hours. Max Gail referred to this in the Jack Soo retrospective episode aired on May 17, 1979, remarking that one of the clips shown was a scene that "we finished around 2:30 in the morning." In a 1977 blooper, a crew member mentions it being 3:15 a.m.
Danny Arnold was the creator of the show, and especially in the early years, he was a marvel. When he was "on", he could spin out entire scenes, ad-libbing dialogue—and great jokes—for every character. By the time those scenes got to script form, though, he obsessively rewrote them. That's true of a lot of showrunners, but Danny couldn't seem to stop himself. Sometime during season 2 (or maybe it was 3) the show was no longer taped in front of an audience, partly because the script was rarely done by show night. When one season began, six pages were in print. Not six scripts—six pages of one script. This meant that on the day the show was taped, the actors would hang around on the stage, waiting for pages to be sent down. Then—sometimes at 2 a.m.—they would have to learn new scenes. Ron Carey (Officer Levitt) would get his fairly quickly: "Here's your mail, Captain." On the other hand, poor Steve Landesberg (Dietrich) might have to memorize long speeches explaining how nuclear fission works. In the early years, Danny benefited from the heroic writing efforts of Chris Hayward, who was a veteran writer, and rookies Tony Sheehan and Reinhold Weege who, like me, didn't know any better. They were the Barney Miller writing staff. My agent wisely turned down Danny's annual offers of staff jobs, negotiating freelance assignments (so-called "multiple deals") for me instead. Even so, the pace was frantic—on one assignment I was given 3 hours to write the story outline. On another occasion, a friend came into my office at ABC-Vine Street and said, "Hey, Reeder, want to go get some lunch?" I pointed to the paper in my typewriter and said, "This script is on the stage—thanks anyway." Employing a live audience became impractical as lengthy reshoots became commonplace. By Season 4, only a quiet laugh track was used when necessary. Marty and Darryl were among the earliest recurring gay characters on American television. Danny Arnold worked closely with the Gay Media Task Force, an activist group that worked on LGBT representation in media, in developing the characters. Initially both characters were presented in a stereotypically effeminate manner but in later appearances Darryl began dressing and speaking in a more mainstream fashion. Officer Zatelli's coming out was not the first gay storyline on American television, but was a memorable one. The series took a while to become a hit, but ABC supported it anyway. Danny Arnold ended production of Barney Miller in 1982 after eight seasons for fear of repeating storylines; the show was not cancelled by the network. Real cops are not usually fans of cop shows. [...] Many police officers maintain that the most realistic police show in the history of television was the sitcom Barney Miller, [...] The action was mostly off screen, the squad room the only set, and the guys were a motley bunch of character actors who were in no danger of being picked for the N.Y.P.D. pin-up calendar. But they worked hard, made jokes, got hurt and answered to their straight-man commander. For real detectives, most of the action does happen off screen, and we spend a lot of time back in the squad room writing reports about it. Like Barney Miller's squad, we crack jokes at one another, at the cases that come in, and at the crazy suspect locked in the holding cell six feet from the new guy's desk. Life really is more like Barney Miller than NYPD Blue, but our jokes aren't nearly as funny. Similarly, during his appearance on Jon Favreau's Independent Film Channel talk show Dinner for Five, Dennis Farina, who worked as a Chicago police officer before turning to acting, called Barney Miller the most realistic cop show ever seen on television. Barney Miller won a DGA Award from the Directors Guild of America in 1981. The series won a Primetime Emmy Award for Outstanding Comedy Series in 1982, after it ended. It received six other nominations in that category, from 1976 to 1981. The series won Primetime Emmy Awards for Outstanding Writing in a Comedy Series in 1980 (in addition to nominations in 1976, 1977 and 1982), Outstanding Directing in a Comedy or Comedy-Variety or Music Series in 1979, and was nominated for a number of others. It won Golden Globe Awards for Best Television Comedy or Musical Series in 1976 and 1977 (from a total of seven nominations), and won a Peabody Award in 1978. In 2013, TV Guide ranked Barney Miller at #46 on its list of the 60 best series of all time. Sony Pictures Home Entertainment has released the first three seasons of Barney Miller on DVD in Region 1. Season 1 was released on January 20, 2004, to slow sales, and Sony decided not to release any more seasons. However, the decision was later reversed and Season 2 was released in 2008 (four years after the release of Season 1), followed by Season 3 in 2009. Shout! Factory acquired the rights to the series in 2011 and subsequently released a complete series set on October 25, 2011. The 25-disc set features all 168 episodes of the series as well as bonus features and the first season of the Abe Vigoda spin-off, Fish. In 2014, Shout! began releasing individual season sets, season 4 was released on January 7, 2014, season 5 on May 13, 2014. Season 6 on December 9, 2014. and Season 7 on April 7, 2015, followed by the eighth and final season on July 7, 2015. Season 1 was released on DVD in Region 4 on December 20, 2006. ^ Garson, Bob (June 7, 1975). "The Law Takes Time Out to Be Human on ABC's Barney Miller". St. Joseph News-Press. p. S2. Retrieved March 23, 2012. ^ a b "The Life and Times of Captain Barney Miller". Internet Movie Database. Retrieved 8 June 2014. ^ a b "Barney Miller – "Ramon"". Internet Movie Database. Retrieved 8 June 2014. ^ Brooks, Tim; Marsh, Earle (June 24, 2009). The Complete Directory to Prime Time Network and Cable TV Shows 1946-Present (Ninth ed.). Ballantine Books. pp. 1688–1689. ISBN 978-0-345-49773-4. ^ a b c Clawson, J. (August 11, 2017). "1974-75 Ratings History". The TV Ratings Guide. Retrieved June 20, 2018. ^ Clawson, J. "1981-82 Ratings History". The TV Ratings Guide. Retrieved June 20, 2018. ^ "Stories Behind the Songs: Chuck Berghofer". Retrieved 15 March 2018. ^ "The Best TV Theme Songs". Complex. Retrieved 15 March 2018. ^ "The 50 Best TV Theme Songs of All Time". Retrieved 15 March 2018. 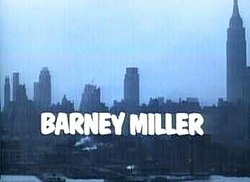 ^ Barney Miller: An Inside Look, By Ken Levine blog guest entry"
^ "Barney Miller". tvtropes.org. Retrieved 23 September 2015. ^ "Netflix helps shift Hollywood's business model". O.canada.com. 2013-07-24. Retrieved 2014-08-25. ^ Miller, Lucas (2005). "Watching the Detectives". 1 March 2005, accessed 31 October 2012. ^ "Chicago – Chicago : News : Politics : Things To Do : Sports". Chicago Sun-Times. Archived from the original on 2014-07-19. ^ "Barney Miller Emmy Awards and Nominations". Academy of Television Arts & Sciences. Retrieved September 5, 2013. ^ "Barney Miller: 7 Nominations, 2 Wins". Golden Globe Awards Official Website. Retrieved January 27, 2014. ^ "Barney Miller Peabody Award Citation". George Foster Peabody Awards. Retrieved September 18, 2014. ^ "Barney Miller DVD news: Announcement for Barney Miller – The Complete Series". TVShowsOnDVD.com. 2011-11-07. Archived from the original on 2015-05-03. Retrieved 2014-08-25. ^ "Barney Miller DVD news: Announcement for Barney Miller – The Complete 4th Season". TVShowsOnDVD.com. Archived from the original on 2014-08-16. Retrieved 2014-08-25. ^ "Barney Miller DVD news: Box Art for Barney Miller – The Complete 5th Season". TVShowsOnDVD.com. Archived from the original on 2014-04-02. Retrieved 2014-08-25. ^ "Shout! Factory – Barney Miller: Season Six". shoutfactory.com. Retrieved 23 September 2015. ^ "Barney Miller DVD news: Announcement for Barney Miller - The Complete 7th Season - TVShowsOnDVD.com". tvshowsondvd.com. Archived from the original on 25 September 2015. Retrieved 23 September 2015. ^ "Barney Miller DVD news: Announcement for Barney Miller - The Final Season - TVShowsOnDVD.com". tvshowsondvd.com. Archived from the original on 21 September 2015. Retrieved 23 September 2015. Wikimedia Commons has media related to Barney Miller.